Originally published in Belgium, this picture book for ages 3+ years is about pets, friendship and loss and is said to be created to help children understand the loss of a pet. 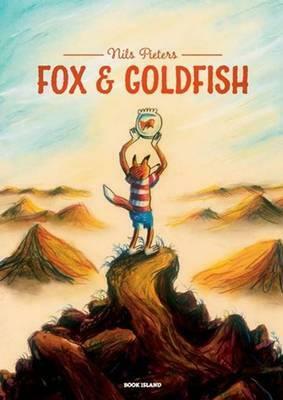 The cover shows Fox holding up Goldfish in his bowl so that the friend can view the world from high on a mountain. In the first page Fox, in only one of a few places where he speaks, says that he fears that Goldfish’s ‘time has come’ and that he ‘can’t just let (him) you go like this.’ Thus he starts off on a quest to show his friend the world before death descends. The Fox and Goldfish venture to many places which are shown in double-page spreads – through meadows, into the ocean (Goldfish frolicking in the water, no longer in his bowl), through deserts, near volcanoes, through jungles and even suburban streets. How a goldfish can survive in ocean waves and even in a puddle defies nature, let along in the snowfields, but would a child be concerned? Probably not. Fox even holds up Goldfish so that his friend in his bowl is also at the end of a rainbow. In the last illustration, before Fox finally says, ‘Okay, my friend, now you can go,’ the two of them are seen on the moon in chairs looking back at planet Earth. The illustrations in Fox and Goldfish are very bright, rendered in coloured pencil and pencil with broad – and sometimes garish – strokes.